Trusts, debts & agency: when is an irrevocable authority not irrevocable? Irrevocable authorities can be (and are) used in many types of business transactions in an attempt to ensure the payment of money or some other form of consideration by one party to another. Whether you are dealing with a property settlement or negotiating the payment of a debt, it is important to appreciate the circumstances when the use of an irrevocable authority will be effective. An inability to enforce payment under an irrevocable authority may deprive you of some or all of the benefit of the transaction entered into, depending on how it is structured. This bulletin explores the circumstances when the use of an irrevocable authority may be appropriate, and when some other arrangement should be made to “secure” the obligation in question. What is an irrevocable authority? An irrevocable authority is an authority given by a principal to an agent for the purpose of securing some form of benefit to a third party beneficiary. For example, in a negotiation in relation to payment of a debt, a debtor (the principal) agrees to pay the creditor (the beneficiary) a sum of money by a specified date. The agreement will often be embodied in a deed entered into between the debtor and creditor. In such circumstances, the debtor might issue an irrevocable authority to its agent (such as an accountant or a solicitor) to pay funds held by the agent to the creditor to allow the transaction to complete. be agreed to separately by the agent in return for valuable consideration given to the agent. confirms or promises that it will comply with the terms of the irrevocable authority. 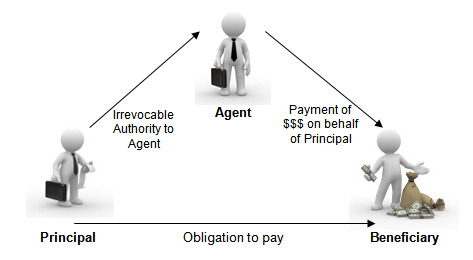 If the agent is not a party to any agreement between the debtor and the creditor, and the element of either valuable consideration given to the agent, or acknowledgement and confirmation remain unsatisfied, then the agent cannot be compelled to comply with the terms of the irrevocable authority by the creditor. In addition, in these circumstances the debtor can instruct the agent not to comply with the authority at any time before payment is made. In such circumstances, the creditor would then face the prospect of needing to consider court proceedings in order to attempt to enforce compliance with the irrevocable authority by the agent and recover against the debtor. Depending on the circumstances, there may not even be a basis to bring a claim against the agent. With the increased use of trusts (for example family trusts and self managed superannuation funds) it is not uncommon for parties to put forward the option of a trust entity satisfying a debt on their behalf, because those funds are also controlled by the party (although locked up in a separate legal entity). If such an arrangement is agreed to, problems can arise if the payment is “secured” by an irrevocable authority for payment provided by the trust entity to its agent and both the trust entity and the agent are external to the main transaction (in our example between the debtor and the creditor). Ensure that all parties with a role to play in the transaction (even where the only role of the agent may be to pay a sum of money) are parties to the transaction (such as by the use of a tripartite deed). If not, then there may not be an ability to enforce compliance with the authority. If including the agent by way of deed is not possible, then consider ensuring that in return for the irrevocable authority, the agent is given valuable consideration. In any event, you should ensure that the agent is actually served with the irrevocable authority. Sometimes the irrevocable authority is exchanged between the parties to the transaction along with other transaction documents, but the authority is not ever served on the agent. In such circumstances, the agent will have no obligation to comply, because it is formally unaware of the authority. Ensure that the agent acknowledges receipt of the irrevocable authority and confirms that the agent will comply.